The rewards of an early morning walk. Hadrian's Library, Tuesday, October 6th, 2015. The archaeological site of Hadrian's Library as viewed from Agora Square. The has been called at times by all possible names, such as Stoa Poikile, Pantheon, or Gymnasium of Hadrian, confused with other ancient buildings known to have had similar considerable proportions. 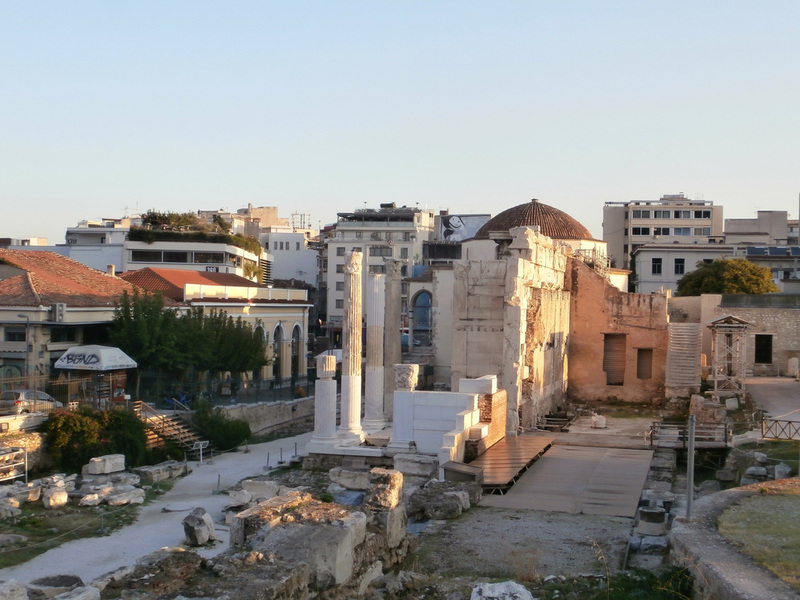 Its identity, however, was established by the 1885 excavations following a great fire that destroyed a considerable number of shops/booths occupying this quarter of old Athens known at the time as the Old Market. Among those miserable lodgings stood a Tower with a Clock, a "gift" from the thug by the name of Lord Elgin to the city of Athens, in exchange for the looting of the sculptures of Parthenon, now held hostage at the British Museum. The Library of Hadrian was an impressive construction of extraordinary richness, as historian Pausanias attests, who extols its "hundred columns of phrygian marble", its "gold cornices" and its "alabaster statues". Unfortunately, of all this cultural treasure nothing was found following the great catastrophes and ravages over time. The principal facade with the entrance from the side of what is now known as Monastiraki Square from Areos Street, formed a portico of 12 meters (39 ft.) wide with four Corinthian columns in projection on the two lateral sides, of which only the half exists, known as Stoa of Hadrian. Each side was adorned with seven monolithic columns in smooth shaft with marble from Karystos and Corinthian capitals of white marble from Mt. Penteli. These columns rest on particular socles and are crowned by a horizontal entablature (the horizontal superstructure in classical and neoclassical buildings that rests on the columns and consists of architrave, frieze and cornice) with projections. In the South and North ends the lateral walls of the great rectangle advance and form two projecting antae, ornamented with pilasters. All this was part of a Propylaeon. ​The library was seriously damaged by the Herulian invasion of 267 and repaired by the prefect Herculius in 407-412 AD. During Byzantine times, three churches were built within the courtyard, the remains of which are preserved: a tetraconch (5th c. AD), a three-aisle basilica (7th c. AD), and a simple cathedral (12th c. AD), which was the first cathedral of the city, known as Megali Panaghia. One more church, named Agios Assomatos, was built against the north facade, but it is not preserved. 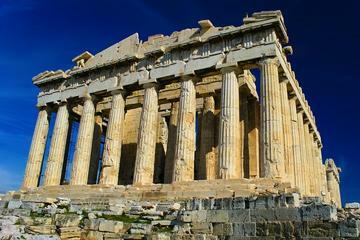 ​For a page with Basic Architectural Terminology, including terms used in the description of the ancient Greek temples, click here! In the vicinity of Hadrian's Library, we will recommend 360 Degrees Hotel on Monastiraki Square, featuring a rooftop bar-restaurant with superb panoramic views of the city and the Acropolis. It offers modern accommodation with free WiFi and easy access to archaeological sites and city attractions. All accommodation types at the 360 Degrees Hotel feature neutral colors with industrial-design details. Each has a TV and a seating area. Featuring a shower, the private bathroom also comes with a hairdryer and bathrobes. Some units offer side Acropolis views.